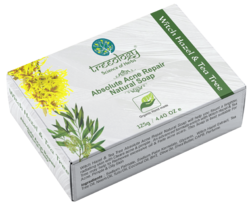 Providing you the best range of bath soap, herbal soap, herbal bath soap, papaya power brightening glow natural soap, tea tree bath soap and absolute acne repair natural soap with effective & timely delivery. •Papaya Bath soap will help you flaunt a brighter, radiating skin with no unwanted dark spots. •An advanced formula enrich with Vitamin A, C & E may help to brighten and even the skin tone. •It slough off dead cells from the skin surface. 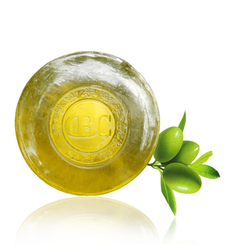 This Soap may help you flaunt a brighter, radiating skin with Clears acne & pimple. Neem is one of the world’s surest, safest, and fastest methods of putting an end to an acne outbreak. •Formulated with Organic Herbs & Essential oils •Papaya Bath soap will help you flaunt a brighter, radiating skin with no unwanted dark spots. Made with Glycerin & Organic Essential Oils. Spatz Cosmeceuticals is an ISO 9001:2008, WHO-GMP & Halal Certified Company with state of the art modern manufacturing unit having own R&D and quality assurance department to maintain highest product quality. 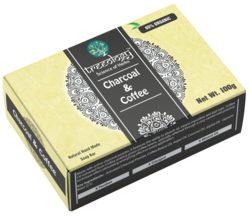 Concern: Charcoal & Coffee Natural Hand Made Soap is very effective to remove skin impurities and detox face and body. • Activated Charcoal Powder, Coffee Beans Oil, Argan Oil, Coconut Oil, Jojoba Oil, Glycerine Base Q.S. •Made with active charcoal powder, It features the ability to absorb oil, cleans impurities and bad odour. •Coffee Oil extracted from Coffea arabica green coffee beans, specially obtained through a very careful cold pressing technique offers stimulating energizing effect on every application. Concern: This soap contains essential Sea minerals that improve skin’s capacity to maintain moisture, which makes it smooth and healthier. 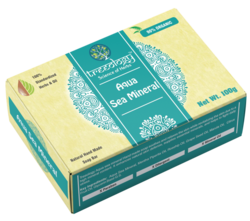 •Treeology Aqua sea mineral Hand made soap soothes and relaxes the skin •It can be revitalizing the skin due to a high mineral content. •It also enhances natural skin defence, supplies essential minerals, and helps to fight daily stress. 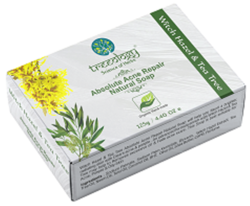 Concern: Tea Tree & Hibiscus soap is entirely natural, and gently lifts away dull skin, leaving you glowing all over. •Tea Tree Oil, Hibiscus Extract, Ylang Ylang Oil, Carrot Seed, Rose Water, Aloe vera Juice, Glycerin Base Q.S. •Treeology Tea Tree & Hibiscus hand made soap is crafted with standardized & validated essential oils & herbs. • Pure Australian Lavender Tea Tree Oil is proven antiseptic active which protects your skin •Hibiscus is a plant extract from the blossoms of Hibiscus that provides astringent, anti-oxidant, moisturizing, anti-bacterial and regenerative effects to skin. Papaya Bath soap will help you flaunt a brighter, radiating skin with no unwanted dark spots. An advanced formula enrich with Vitamin A, C & E may help to brighten and even the skin tone. It slough off dead cells from the skin surface. 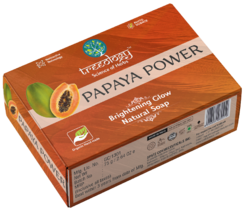 • Papaya Bath soap will help you flaunt a brighter, radiating skin with no unwanted dark spots. • An advanced formula enrich with Vitamin A, C & E may help to brighten and even the skin tone. • It slough off dead cells from the skin surface.